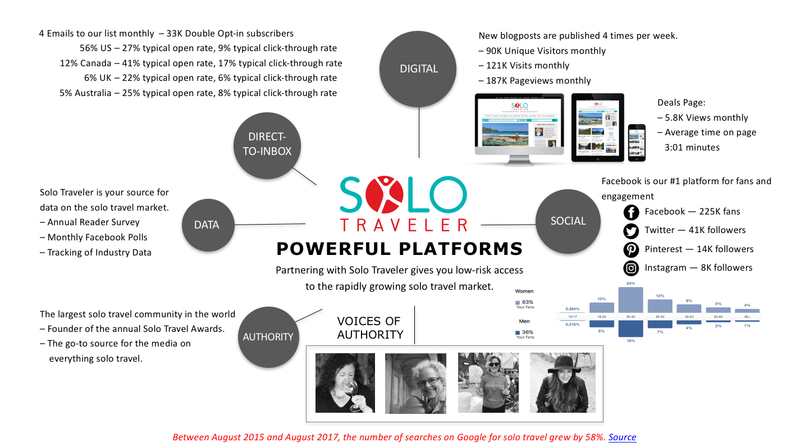 Solo Traveler is the authority on the solo travel market. We deliver market insights and direct access to the fast-growing solo travel market. Solo Traveler has the largest, most diverse and engaged community of solo travelers in the world. Our community looks to us for information and inspiration. "We have been working with Solo Traveler since Jan 2015 on the Advisory as well as in other areas. It has always proved to be a successful advertising venue for us with a receptive and engaged audience"
Working with destination marketing organizations, Solo Traveler inspires people to venture out to new destinations. We deliver sponsored content with information solo travelers need while meeting the objectives of our clients by leveraging the site, social platforms, and our subscriber base. The Solo Travel Advisory and Deals page deliver proven sales results for tour, cruise, and travel companies targeting the solo travel market. Solo Traveler develops customized partnerships, from consultation services to multi-channel branding and sales, based on specific client needs. Our 2017 Reader Survey had 983 respondents. Solo Traveler's primary age demographics are Boomers and Millennials. - 84% have university or post-graduate degrees. pleasure. A further 33% travel twice a year. - 72% plan to travel more in 2018. 7% in domestic, and the balance in both. how much they’re spending, and more. We know what resonates with solo travelers. With this information we’re able to help you better target your message. Contact us and let us help you tap into the growing solo travel market.